That same morning, 400 miles south, the world took notice of another movement—one with aftershocks still spreading today. In a skeptical front-page story titled “Weird Babel of Tongues,” a Los Angeles Times reporter attempted to describe what would soon be known as the Azusa Street Revival. The “newest religious sect” had, in fact, been around for a few years. 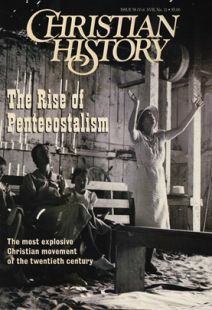 Beginning in the late nineteenth century, Midwestern Methodists and other Christians associated with the Holiness movement had become obsessed with divine healing and the possibility of speaking in tongues—doctrines and practices that dispensationalists argued had ended with the apostolic age. One of these Holiness Christians was an 18-year-old Kansas collegian named Charles Fox Parham. Like other Methodists, Parham believed that sanctification was a second work of grace, separate from salvation. But he also adopted the more radical Holiness belief in a third experience—the “baptism with the Holy Ghost and fire.” As early as 1891, Midwesterners heard young Parham claim that glossolalia—speaking in unknown or foreign tongues—should accompany this baptism in the Holy Spirit. A handful of his listeners accepted him as a latter-day Elijah, ushering in Christ’s return. Some wrote him off as another self-appointed prophet, while others branded the skinny and often sickly Parham as a fanatic. To perpetuate his views, Parham opened a Bible school in 1900. It was housed in a three-story, turreted Topeka mansion dubbed “Stone’s Folly” because it had bankrupted its builder. (Local residents had thought the building was haunted.) In developing his “Apostolic Faith” theology, Parham promoted a revolutionary but short-lived theory—which even Christian and Missionary Alliance leader A. B. Simpson would toy with. Simply put, Parham believed God would supernaturally give known, earthly languages to baptized believers so they could quickly evangelize the world. This end-time revival, accompanied by believers speaking in known languages they had never learned (xenolalia), would bring to an end the church age and bring back a triumphant Christ. Even Parham’s missionaries—and those later sent out from Azusa Street—found difficulties when it came to putting this belief into practice. For example, A. G. Garr, the first white man to speak in tongues at Azusa, went to India expecting the Spirit to enable him to speak Hindi. When this did not happen, Garr and his wife went to Hong Kong and studied Chinese. Though Parham never gave up his belief that he and his followers had spoken in earthly foreign languages, his followers discovered that if foreigners understood them, it was an exception rather than the rule. Yet Charles Fox Parham based his life on the exceptions rather than the rules. The status quo, he believed, was rarely in touch with the Spirit. He left the Methodist church, calling it predictable and staid. He searched for the missing element he believed would lead Christians back to the true, nondenominational New Testament church. He decided the missing element was speaking in tongues. At his Bible school, Parham assigned his students to search the Bible for demonstrable evidence that a believer had been baptized in the Holy Spirit. Their conclusion matched Parham’s: the Holy Spirit is manifested through tongues. Convinced of their findings, Parham and his students conducted a Watch Night service on New Year’s Eve to ring in 1901. One of the students, a 30-year-old evangelist named Agnes Ozman, asked (in Parham’s words) “that hands be laid on her to receive the Holy Spirit as she hoped to go to foreign fields.” As he prayed for her, “a glory fell upon her, a halo seemed to surround her head and face,” and she is reported to have spoken in Chinese. Though many people believed Ozman’s experience proved Parham’s teachings, it is unclear if she actually spoke in Chinese or simply a “heavenly language.” In any event, within the next few days, about half of the school’s 34 members, including Parham, spoke in tongues. Meanwhile, the press was giving Parham’s Apostolic Faith band and its critics front-page coverage. The publicity gained the “Parhamites” more notoriety than fame. Parham closed the school to spread the news of revival with his more devoted students (several students dubious of the recent events had left the school). Their message was met with less than overwhelming success. Though crowds did not show up to see the tongues-speech, reporters did. Following several scathing articles and the death of one of Parham’s sons, the pioneer struggled. He continued to preach here and there, witnessing healings and glossolalia but without great success. Not until a Galena, Kansas, revival in late 1903 did Parham begin to see the results for which he had prayed. Newspapers as far away as Cincinnati gave these meetings favorable publicity as Parham gained several thousand converts. Crowds in Galena and other Midwestern towns soon learned that Parham was not your usual Sunday morning preacher. Often dressed in Palestinian costume, he warned his listeners that “God will hold them responsible if they do not join in this great crusade with our captain, Jesus, against sin and Satan.” He viewed himself as the “projector” of the Apostolic Faith (also called Pentecostal or Latter Rain) movement, though he opposed officially organizing the group. While Parham preached throughout the Midwest, Texas, the East Coast, and into Canada, claiming a following of 13,000 to 25,000, an even larger Pentecostal movement was happening in Wales, at New Quay on Cardigan Bay. American Holiness publisher S. B. Shaw stirred worldwide interest in that awakening with his 1905 book The Great Revival in Wales. For many believers, the Welsh Revival became a rallying cry for God to do it again. And it prompted many of them to conduct prayer meetings that went on for years. From Kansas in 1905, Parham took a band of his protégés into Texas. There he preached, distributed his The Apostolic Faith newspaper, won converts, and set up a non-credit Bible school. One of the students attracted to the school was a former waiter and southern Holiness preacher, William J. Seymour. In the Jim Crow South, Seymour, a black, could take part in the Bible studies only by sitting in the hallway outside Parham’s classroom. After only a few weeks of listening to Parham, Seymour received an invitation to pastor a small Los Angeles church of Baptists expelled from their congregation for espousing Holiness doctrines. Seymour carried more than his luggage to California. He boarded the steam train in the Houston depot with enthusiasm and Parham’s finely tuned statement of faith. The 35-year-old Seymour was an unlikely ambassador of the Pentecostal message: he was the son of slaves, not a gifted speaker, lacking in social skills, had almost no formal education, and was blind in one eye. But perhaps his greatest handicap was the fact that he had never spoken in tongues, even though he preached that such a sign should be a part of every believer’s experience. His message, that speaking in tongues was the “Bible evidence” of baptism in the Spirit, was well received by the congregation but not by the pastor, Julia Hutchins. It is unclear how long she let Seymour teach such things, but she soon had the door padlocked shut against him. Seymour and most of the congregation found an open door for ministry in the Edward Lee home where he was boarding. The Lees and a small group had been praying for a another Great Awakening, a Welsh-type revival that would turn Los Angeles upside down. And they believed that Seymour might be the catalyst. When the Lee home grew too small for the interracial crowd that gathered for Seymour’s Bible studies and prayer meetings, Richard and Ruth Asberry opened their home at 214 (now 216) North Bonnie Brae Street, even though they then disagreed with some of his teaching. On April 9, 1906, Edward Lee asked Seymour to pray for him that he would be given the gift of tongues. When Seymour prayed, Lee spoke in tongues, fulfilling a vision he said he had received in which the apostles taught him how to speak in tongues. Seymour immediately left for the Asberry home Bible study and prayer meeting, where he again preached from Acts 2:4 and related Lee’s experience. As he continued his study, someone else began speaking in tongues. Others followed. Jennie Moore, Seymour’s future wife, sat down at the piano and improvised a tune while singing what she thought was Hebrew. Crowds of both black and white faces descended on the Asberry home over the next several days. On April 12, the first white man spoke in tongues. More importantly, Seymour, “the prophet of Pentecost to Los Angeles,” finally received his personal Pentecost. And that same day, the Asberry’s front porch gave way from the weight of the crowds. That’s when leaders negotiated a lease for the former Stevens African Methodist Episcopal Church at 312 Azusa Street. The windows were knocked out. Debris littered the floor. Its last occupants had been livestock, since it had most recently been used as a stable. It was more like the rustic outdoor camps of the Holiness movement than the stained-glass churches of the distrusted denominations. And since it was not in a residential area, meetings could go all night. "Let the Tongues Come Forth!" There were no hymnals, no liturgy, no order of services. Most of the time there were no musical instruments. But around the room, men jumped and shouted. Women danced and sang. People sang sometimes together, yet with completely different syllables, rhythms, and melodies. At other times the church joined together in English versions of “The Comforter Has Come,” “Fill Me Now,” “Joy Unspeakable,” and “Love Lifted Me.” At various places, some would be “slain under the power of God” or entranced. Depending on the observer, the occurrences were either proof of God’s presence or of the participants' fanaticism. But to all witnesses, it was something new. Despite the frequent critical news reports, the curious and genuine seekers continued to pour down Azusa Street. In fact, when the Times printed a speaker’s prophecy of “awful destruction” the day of the San Francisco earthquake, many residents' interest was piqued. Many of the thousands who poured into 312 Azusa Street between 1906 and 1909 heard the revival news through the widely circulated The Apostolic Faith. The paper not only kept readers abreast of what was happening in the “City of Angels” but also in churches and mission stations around the world. Whether the seekers read the paper or came in person, they were certain to receive messages emphasizing repentance, salvation, humility, worship, healing, deliverance from demonic possession, holy living, and the baptism in the Holy Spirit. Along with the success, hurts and heartaches soon came to Azusa Street. Seymour and the faithful learned to expect criticism from newspapers and leaders of other churches—including the founder of the Pentecostal Church of the Nazarene, P. F. Bresee, who believed that Holiness people were already baptized in the Holy Spirit and that the Azusa tongues were not from God. But some of the harshest criticism came from inside the little mission, with the mother church splitting because of personality clashes, fanaticism, doctrinal differences, and racial separation. It was said that some whites left because the blacks had a lock on the leadership. Seymour, proving that he was no more perfect than his critics, reportedly asked the Hispanics to leave, and later wrote by-laws that prevented anyone except African-Americans from holding office in the mission. The often-quoted line that “the color line was washed away in the blood” was true in practice for only a short time. Through the early months of the revival, Seymour gave credit for the movement’s origins to Charles Parham and said that Azusa was an extension to the Midwest Apostolic Faith. Expecting a visit from Parham, Seymour wrote, “He was surely raised up of God to be an Apostle of this doctrine of Pentecost.” But that “grand meeting” of October 1906 ended in a division that never fully healed. Parham was shocked at what was being called spiritual manifestations. At what Seymour viewed as God-sent, Parham cringed with disgust, even labeling some adherents as spiritists. But though the founder and most prominent leader of Pentecostalism renounced it, Azusa Street eclipsed him as the center of the new movement. After some three years of daily, high intensity revival meetings, the Azusa Street Revival, still under Seymour’s leadership, began winding down. When the crowds fell off, the mission soon looked like many other Pentecostal missions sprouting up in the Los Angeles area, with only sparse attendance. Eventually, after Seymour’s death in 1922 and his wife’s in 1936, the mission closed and was razed. Only memories were left. But a new chapter in the history of the church had begun. James R. Goff’s Fields White Unto Harvest: Charles F. Parham and the Missionary Origins of Pentecostalism examines Parham as “a symbol for the sociological origins of Pentecostalism.” But don’t let the abstract introduction fool you; from Parham’s frontier roots to his fall into obscurity and rejection, his life is fascinating. And Goff tells it well. You can also buy the story of Azusa Street by Frank Bartleman, the primary chronicler of Pentecostalism’s Los Angeles origins. His 1908 history of the mission is still being published. Speaking of republished materials, The Original Azusa Street Revival Devotional is still available, too. Ted Olsen was assistant editor of Christian History.